Scratch cards are such a popular way to gamble because all it takes is a simple scratch of a cardboard token for someone to find out if they are a winner. 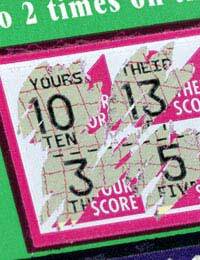 Scratch cards are a relatively recent phenomenon. Their inspired design, where a piece of cardboard is coated in special non-transparent substance that can be scratched off, first appeared in the U.S. in 1987 as the ‘instant scratch n sniff-off’ lottery ticket. Their swift subsequent rise in popularity was largely due to offering players low cost gambling and the exciting novelty of the instant win, thereby saving the drawn out suspense of the traditional lottery. Scratch cards are also popular because their lower value cash prizes compared to lottery wins and casino jackpots mean that players stand a greater chance of winning. In fact scratch cards frequently offer relatively high odds on winning something just so that players keep buying the cards. Promoters know all too well that if a player wins a cash prize every now and again, even if it’s only five pounds, they will keep on buying the scratch cards believing their luck will continue. The little money they do win will often be used to buy more cards, thereby relieving some of the guilt of forking out money for bits of cardboard whilst making sure the promoter does not lose money on giving out prize money. The actual odds on winning the high cash prizes are usually very low indeed. In the U.S. recent years have seen a trend towards more expensive scratch cards that cost around 20 or 30 dollars but offer jackpot prizes of millions. This concept has not really caught on because it misses the two key attractions of scratch cards – the apparent cheapness and the opportunity for an instant win. Jackpot winners of such scratch cards often find their ‘instant’ prize is not forthcoming and instead takes many years to be paid out. Another recent trend in the world of scratch cards is to attempt to predict which cards are still offering the top prizes. The number of instances where cards have been on sale despite all the major prizes having already been claimed has prompted various amateur and professional groups to track the number of prizes won and cards sold to thereby determine the current odds on certain games. If studies show that all the top prize cards are still in circulation then the odds on winning will be at their height, whereas if the big prizes have all been claimed, the odds on winning will be nil and the purchase of a one pound card would be a waste of money, as it would be effectively worthless. The peculiar thrill of scratching off that strange silvery substance may be missing, but that hasn’t stopped scratch cards from making the ever popular move onto the web. These online scratch cards are instead played by clicking on a particular area to reveal the card’s prize. Anything that draws the public in so successfully as scratch cards will inevitably capture the imaginations of con artists. A typical scam involves scratch card winners spending as much as £10 phoning up a premium rate number to receive a code entitling them to a top prize. The top prize is usually not all it seems. A recent case in Bristol offered a computer prize with a £116.33 compulsory warranty attached. These has been some debate over the actual criminality of such ‘scam’ acts, because many scratch card promoters have managed operate within in the limits of law by using deliberately misleading term and conditions to effectively ‘hoodwink’ their customers. It is therefore in a player’s best interests to exercise caution and read the small print if they need to phone a number in order to claim a prize. Fortunately the power of scratch cards has not solely been used for wrongdoing. Councils across England have been using the popularity of scratch cards as a way of encouraging people to recycle and help the environment. Lancashire County Council, for instance, gave each of its 100,000 households the chance to win instant money prizes on free scratch cards if they agreed to get involved to their recycling programme. Pre-empting any accusations of bribery, they stated openly that they were ‘unashamedly using pester power’ to get more households aboard the recycling ship.